Flick the booster switch on your leadership and start teaching like never before! If you’re a Leader, Teacher, Coach, Manager or Parent you need to ask yourself this question…Are you igniting success in others or hindering it? The Art of Encouraging Excellence in Your Students is a must for anyone serious about improving their leadership skills. Celebrate the official launch of NLP Essentials for Teachers and receive over $2000 of bonus gifts with your purchase of this practical guidebook. If you’ve ever wondered what it REALLY takes to be an effective leader, or an exemplary teacher, this book is for you! Positively leading and influencing others takes vision, skill, persistence and courage to overcome fears, setbacks and limiting beliefs. Master Trainer, Educator, Success Coach and NLP Specialist Gaye O’Brien will show you keys to new techniques that will stretch and empower you and unlock excellence in those you lead and teach. With over 25 years leading education initiatives, her work stretches from helping struggling learners, simplifying issues for frustrated parents, and advising educators across the whole spectrum of educational learning. Gaye’s wisdom is well grounded in academic insights and has been seasoned and refined by many discoveries in the field. Rest assured Gaye has done the hard yards for you. She has painstakingly collated and summarized proven resources, and revisited some of her disappointments, key successes and triumphs as an Educator. Gaye O’Brien has devoted her life to the art and science of learning. 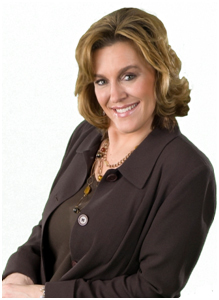 She is a seasoned educator, inspirational speaker, author, Neuro Linguistic Programming trainer, and personal coach. She has shared her insights with the likes of: New Living Magazine, Today’s Parent USA, National Consumer, Eastern New Mexico University, The Maggie Linton Show, Naturally Savvy Radio, Corporate Talk with Charlie & Eva, Its Your Health Network, Body & More Magazine, ABC Capricornia, and Radio Nag. You've got to read this book! Gaye's teachings will help you unlock knowledge you're not yet capitalising on and will help you build skills to deliver your message clearly and with more impact. It's engaging and Gaye knows her stuff. Highly recommended! - 5 Times Best Selling Author, International Speaker & "Millionaire Maker"
This new book might just be the ultimate guide for leaders and teachers. Through NLP Essentials for Teachers you’ll discover how to teach and lead with a vitality that ‘cuts through’ and causes learning to ‘stick’. Unlike many self help books out there today, Gaye O’Brien’s teachings are based on grounded success principles and practical insights (the fluff has been avoided). The book uncovers the exact methods Gaye herself uses and shares with clients. NLP Essentials for Teachers is a handy pocket-sized guidebook for easy reference – it is laid out in a pleasing format with good graphics and information. NLP Essentials for Teachers is suitable for people from all walks of life, all ages, and occupations. It will have an immediate impact on the way you lead and teach. The improvements you seek are just a breath away, and, a few changes in your delivery will bring them to you. You will add more ‘grit’ to your leadership, manage ‘knock backs’ better and develop strategies to unlock hidden knowledge in those you nurture. 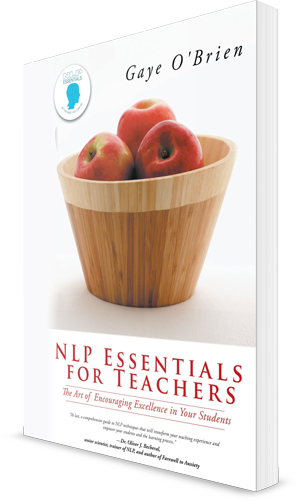 Celebrate the official launch of NLP Essentials for Teachers and receive more than two thousand dollars of bonus gifts with your purchase of this practical guidebook. Receive Amazing Bonus Gifts from Gaye and Friends! “Using NLP Strategies to Develop an Empowering Mindset” A fascinating interview with Gaye O’Brien on Tough Talk Radio PLUS Half Hour FREE Strategy Session! “3 Steps You Need to Live the Life You’ve Imagined!” Exclusive Training Videos and PDF’s (Free Bonus valued at $349) with Shawn & Keli Carpenter. Online Presentation – “The One Secret Manifesting Technique that Will Have You Achieving Your Goals Like Magic” with Peggy McColl. “Banish the Stress – Strategies for Success” An insightful E-Book by Andrea Fisher, Frontline Social Worker, Counsellor, Trainer & Coach. 30 days Free Membership to Heart Healthy Woman – Susan Levy will open the door so you can enjoy a resource packed full of recipes, tips and insights for a healthy heart. “Split at the Root: A Memoir of Love and Lost Identity” a beautifully written memoir of race, adoption and identity by Dr Catana Tully (Author, Actress, Artist and ex Associate Professor). Three Coaching Sessions (Free bonus valued at $500) by Elizabeth Olagunju – Senior Coach & Consultant. “Put Your Money Where Your Mouth Is” PLUS Free dental articles (Free Bonus valued at $35) by P.Piero DDS, Dentist, Inventor, Author. “7 Easy Steps to Midlife Career Change” an inspiring Ebook by transitional coach Rod Steele. “The Health Revolution” an interesting insight into healthy alternatives for mental disorders by Orthomolecular Psychologist, Phil Bate. “Business Foundation Review, Report & FREE Half Hour Phone Session” (Value $450) Helps business owners take control of their business, take back their lives and enjoy the freedom businesses should give. Hosted by experienced financial professional, business strategist and chartered accountant Monica Brewer. “Reach Children Using Video eCourse” (value $79) An educational video course training teachers how to reach their students and parents using innovative iPhone and email techniques. Hosted by Jayne Rios, CEO and Founder of Express Yourself eLearning. “Exclusive One Week Free Membership to Videos & Audios Superconscious Training” to energize and inspire you, free your mind and activate your human potential with Dr. Vie. Plus more than 30 extra power-packed gifts from experts in the field of life and business growth! See what others are saying about the Book! Gaye’s book is the complete guide for learning, understanding and applying NLP practices. She gives the most practical strategies to help motivate yourself, others and maximize potential. I highly recommend this book to anyone who is in a position of influence. I'm not a teacher but I've always been interested in NLP. I found this to be an excellent intro that covers the basics in a clear, concise fashion and shows how NLP can be a resource to teachers and other educators. I appreciated the lack of padding and "fluff" one finds in so many books of this type. 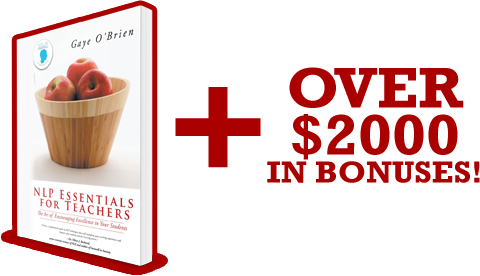 O'Brien's book is straightforward, easy to read and user-friendly. What I see looks well researched, succinct yet potent and a great piece of work. Again congratulations on what is a great and important contribution to our field(s). I think it should be mandatory that every teacher and educator reads this book. An excellent read. I wish I had been given this book at the start of my teaching career! I urge anyone who wants to move to the next level in teaching, to read this book.